UKAS assessed the Aberdeen based business who are now certified as a type A inspection body as per ISO/IEC 17020 conformity assessment standard. UKAS provides ISO/IEC 17020 accreditation to organisations performing various types of inspection, surveys and risk assessments. • The Offshore Installations (Offshore Safety Directive)(Safety Case etc.) Regulations 2015 SI No. 398 (OSDR). • The Offshore Installations and Wells (Design and Construction, etc) Regulations 1996 SI No 913 (DCR). • The Offshore Installations (Prevention of Fire and Explosion and Emergency Response) Regulations 1995 SI No 743 (PFEER). 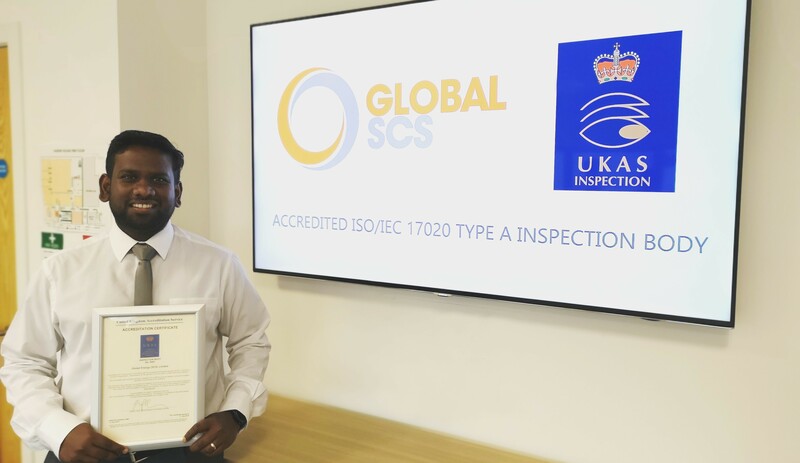 Arul Senthil, Verification Services Manager, said: “The UKAS accreditation as a Type A inspection body is quite an achievement and a very important milestone for Global SCS. Accreditation helps lift the perceived barriers to entry to the verification and equipment certification market here in the UK. “Getting accredited by UKAS – the appointed body for the United Kingdom, provides an additional assurance that we take the management of competency, impartiality and objectivity very seriously and that the quality of services offered can be relied upon. Steven Dunbar, Global SCS Managing Director, said: “It has been a tremendous effort from Arul and all of the team in Global SCS to achieve such a major accreditation. as Design Review, Pipe Stress Analysis, Container Certification and QA\QC Inspections etc.